After much rain for weeks in a row, the afternoon of June 1st was miraculously sunny. 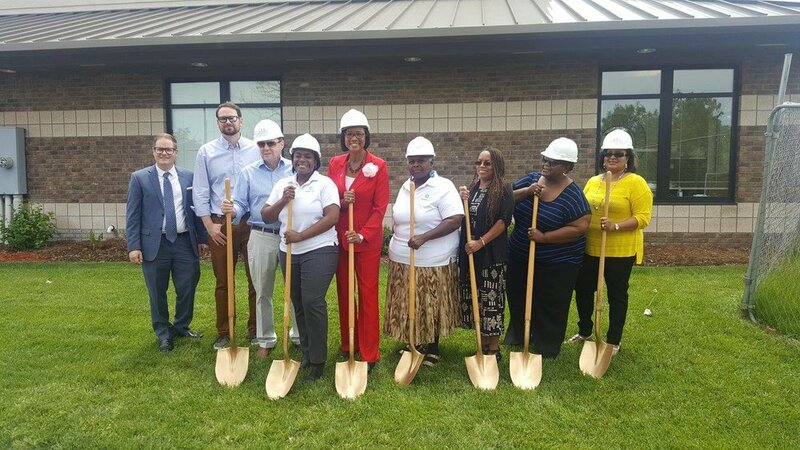 The construction site “pool” in the back of HealthCore Clinic was still there, but it certainly did not spoil the groundbreaking ceremony scheduled for that day. After 10 years, the clinic is finally receiving a 30,000 square feet addition to its headquarters, which will consist of a four-story clinic and medical office building, and Jaco is taking over as their general contractor. The event had a much better turnout than expected, and we were lucky to host roughly 50 guests, including Wichita’s Vice Mayor Levonta Williams, several members of the Wichita Metro Chamber of Commerce, Healthcore’s staff and board, the architects from Architectural Innovations whom have designed the expansion project, and our very own Jaco personnel. Earlier this year, the Wichita Business Journal wrote: "The project will allow HealthCore to expand its services to under-served and at-risk populations. HealthCore is a federally qualified health center, meaning the clinic receives federal funding to help provide access to primary health care services regardless of a person’s ability to pay." We are so honored to be a part of the growth of such an amazing institution that supports a beautiful cause.